The lively market town of Epping is ideally located for commuters with young families; it serves as the final station on the London Underground’s Central Line, and it is bordered by working farmland and the beautiful Epping Forest. 1st Choice has been fitting electric gates and driveway gates as security features for domestic residencies in this area for over a decade now. Many commuting families value the added layer of security that our automatic gates can provide, especially if they have to leave their home unattended for long hours whilst they’re at work. Epping enjoys a low crime rate and one of the worrying trends we’ve noticed is that some households are failing to repair their automatic security gates. We understand that complacency can set in over the years, especially if you live in an area with an active neighbourhood watch, but we would always strongly advise our customers to undertake automatic gate repairs as soon as a problem may arise. Prompt electric gate repairs demonstrate a proactive approach to security; they demonstrate to criminals that you’re actively protecting your home, assets and family. A poorly maintained driveway gate gives exactly the opposite message and alerts the opportunist criminal to the idea that security isn’t top of your agenda now, so maybe this is a good time to strike. Looking to Reduce Your Driveway Gate Repairs? At 1st Choice Security Systems we make our clients’ security our number one priority, so whether your automatic gates were fitted by us, or by another company, we will get our dedicated electric gate repairs team to you promptly in order to ensure your resumed security as quickly as possible. In order to minimise repairs, we offer a maintenance package which means that we will service your driveway gates regularly in order to maintain an effective safety perimeter to your home or business, and cut down on costly repairs caused by ongoing neglect. 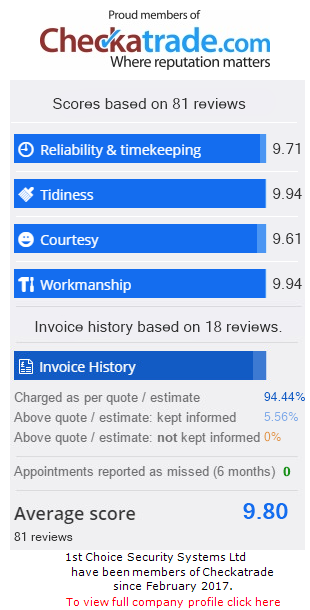 Why Choose 1st Choice for Electric Gate Repairs in Epping? Our local knowledge allows us to provide you with accurate security information. We put your family’s security at the top of our agenda, and provide you with expert advice to help keep them safe. We will maintain your automatic gates to ensure that they are doing the job you installed them for effectively. 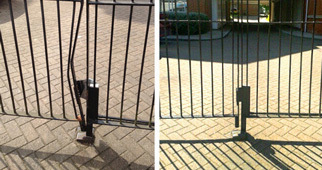 We provide rapid electric gate repairs in Epping and the surrounding district. Our dedicated repair team offer a skilled, professional and friendly service. Contact us today on 0800 118 2414 to book a consultation with one of our security experts who can advise you on the installation of automatic gates, electric gates or driveway gates to secure your property in and around Epping. 24 hr Emergency Response on 0800 118 2414 – If you have a requirement for repair, maintenance or servicing of your electric gates in Epping, or surrounding areas, then please get in touch today.